PURPLE Crying: What Is It? What Should You Do? Do you have a baby who cries for periods every day and is inconsolable? Did you think they might be ill or have colic, but they don’t have either? You might have heard of PURPLE crying and be wondering what it is. This was a new concept to me. I came across it when I was trying to find out why my baby would cry for a few hours every night. My baby was fed and diapered and did not seem to have gas. Nevertheless, the crying was relentless and for no apparent reason. Everything had been checked out by the pediatrician and my baby was healthy and well. Let’s take a look at the theory of PURPLE crying and see what it entails. What If Nothing Soothes My Baby? It’s normal for babies to have bouts of crying, especially when they are small. For the first few months of their lives, you can expect some periods of inconsolable crying. Chances are, you will find this worrying and frustrating, wondering what on earth you can do, especially if it’s your first baby. The period of PURPLE crying is a theory coined by a developmental pediatrician, Ronald G. Barr. You’ll be relieved to know the crying phase will eventually pass and is only temporary (source). “P” is for the peak of crying: Babies will likely cry more when they are two months old. As they approach between three and five months, they will cry less. “U” is for unexpected: The crying can accelerate and remit, but you don’t know why. There is no apparent reason for it. “R” is for resists soothing: No matter how hard you try, there’s nothing that will stop baby from crying. “P” is for pain-like face: Your baby may look like they have pain, even though they don’t. “L” is for long-lasting: The bouts of regular crying can last for up to five hours a day, or sometimes more. “E” is for evening: Crying is likely to happen more in the late afternoon or evening. All babies will go through some periods of crying. If you are one of the lucky ones, this won’t last for long periods of time, certainly not for days or months. On the other hand, you might be unlucky enough to have an inconsolable baby almost every night for several hours. There is no discrimination between bottle and breastfed babies. It can happen to all babies, to a greater or lesser extent. This crying tends to start when a baby is about two weeks old. It can increase in intensity and duration, in some up babies until they are two or three months old. The crying then starts to decrease and eventually stops. It is a normal part of every baby’s development. Provided you have ruled out any medical conditions with your doctor, then it’s good to know the crying will stop at some point. Although it can be frustrating and even anger provoking, be assured your baby is not doing it on purpose. Dr. Barr’s theory aims to give parents and caregivers a better understanding of why a baby might be crying. It also aims to reassure them that this period of PURPLE crying is temporary. Crying, even when it’s not a cause for alarm, can be stressful for parents or other caregivers. 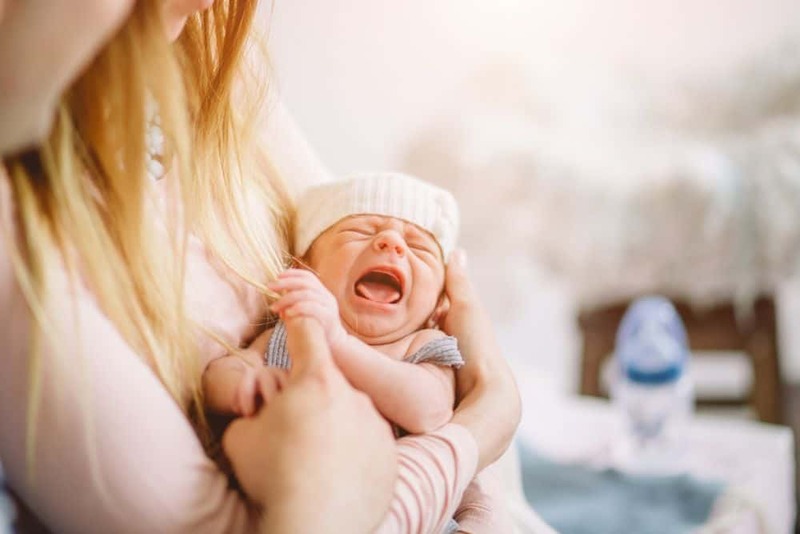 It’s inevitable that a baby will cry at times, but it can be a bit of a shock for new moms and dads when the crying is relentless. Try keeping your baby in calm, peaceful surroundings, especially at feeding times. This might help keep the crying episodes at a minimum. After a long, tiring day of looking after your baby, their crying can be upsetting. This can also be the case for dads, or moms, that have been at work all day. They come home wanting some quality time with their little one, who is red in the face and screaming. Give your little one lots of TLC (tender loving care) and don’t leave them to cry. You can’t spoil a baby at this time of their life, so let them know you are there, giving them lots of cuddles. By responding to their crying with love, you will give them the attention they need to develop (source). There are times when, no matter what you do, the crying won’t stop until your baby is ready. Once you’ve made sure they don’t need a diaper change, aren’t hungry or ill, there are a few other things you can try. Try holding baby close to you, possibly with skin-on-skin contact. You could sit in a rocking chair while you do this, or maybe just sway from side to side or back and forth. Walk around holding your baby close, and maybe swaddle them at the same time. Singing gently to them can be soothing. Popping them in a stroller or carrier and going for a walk can also help. The one way I found to console my baby was to break out the car seat and drive around. While the crying continued for a short while, the motion soon worked its magic and peaceful sleep ensued. Sometimes it was just a few times around the block, other times it could be driving all over town. Some babies will respond to a nice warm bath, while others might like the rhythmic sound and vibrations from a fan (source). There are times when, no matter what you try, nothing works. You just have to leave the crying episode to run its course. While it’s going to be hard, you need to remain calm, not just for baby, but for your own sanity as well. Babies are perceptive and seem to know when we are anxious or nervous. This might exacerbate their crying bouts. If you’re finding it hard to cope and are getting stressed, then walk away for a while. You could pop baby in their crib where you know they’re safe and just take a few minutes away to calm your frazzled nerves. If you can get a family member, neighbor, or competent babysitter to look after your little one for a few hours, this can give you some valuable time to relax. Go out for dinner, go to the movies, or just get some quiet time. After this time away, you should find your reserves are replenished and you’re better able to cope. It’s normal to feel upset or angry when your baby is crying so much. Being a parent can be hard, especially when it’s not all sunshine, roses, and smiles. It’s not that you’re doing anything wrong — you’re not a failure and you aren’t a bad parent. Whatever you do, make sure you reach out for help — don’t channel your anger at your baby. Keep a few numbers of trusted friends and family members on speed-dial for when you can’t cope. Don’t ever shake your baby in frustration — this can have dire consequences. Called Shaken Baby syndrome, it can lead to brain damage, blindness, or other psychological issues. If severe, it can be life-threatening and even fatal (source). There are times when baby’s crying might be an indication that things aren’t all as they should be. If there are other signs, like fever, diarrhea, vomiting, or baby seems otherwise unwell, then seek medical help. You will soon get used to your baby’s cries and patterns of crying, so anything out of the ordinary should set off alarm bells. All babies will cry to a lesser or greater extent during the first few months of life. It’s not anything you’re doing wrong, it’s just the way it is. It’s tough on you while it’s happening, but there is a light at the end of the tunnel. It’s likely once your baby is older than three or four months that this will stop. In the meantime, stay strong and give your baby all the love and attention they need. If at any time you think there may be something wrong, have your baby checked out by a doctor. We hope you enjoyed our insights on PURPLE crying. Hopefully, you have picked up some useful tips and reassurance that you are not alone. Please leave us a comment and don’t forget to share with other moms so they can benefit as well.